Cooking in Mamma Laura’s kitchen was a fantastic culinary experience. 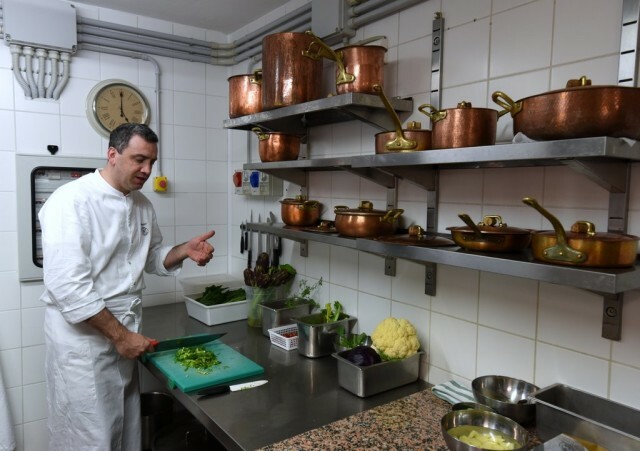 But for a more refined take on Italian cooking, we joined Chef Roberto behind the scenes at his restaurant. 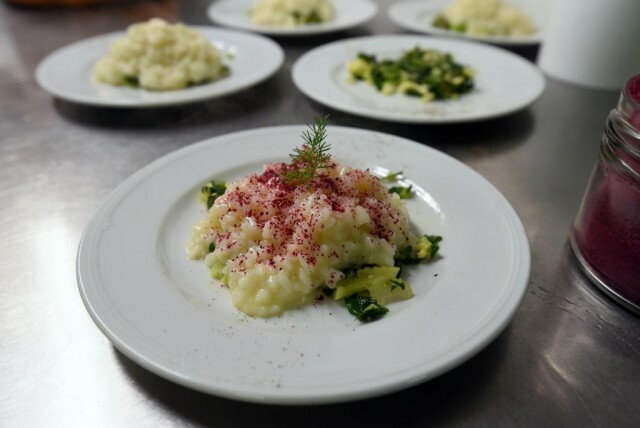 Our agriturismo arranged this experience as “sort of a cooking class,” but it turned out to be so much more: We were flies on the wall of a brilliant chef’s working kitchen — a graduate-level seminar on Advanced Italian Flavors. 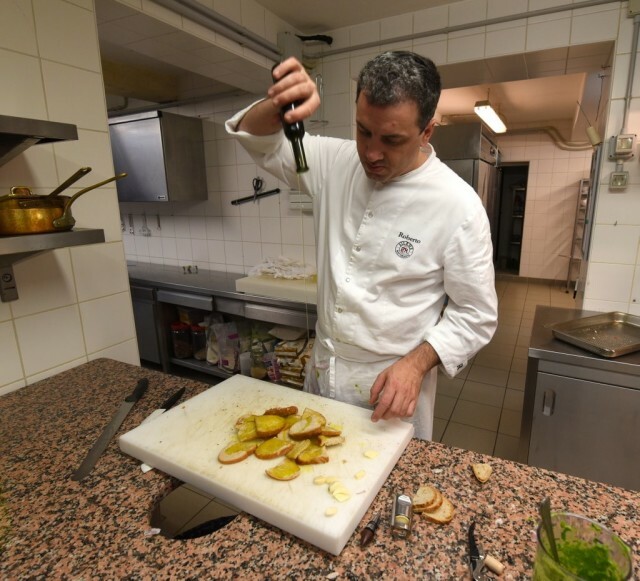 Chef Roberto Rossi owns a Michelin star and a fine restaurant in his humble home village of Pescina, stranded high on the slopes of Mount Amiata. To reach Ristorante Il Silene, we corkscrew up and up — on choppy gravel roads — into the mountains overlooking the Val d’Orcia. As we gain altitude, fat raindrops become fat snowflakes. Finally, we crest a summit and enter a remote village where we park, scurry across the street in the slush, and step into the cozy-classy world of Il Silene. At 4:30, Roberto invites us back into the kitchen. With playful eyes under curly black hair, and a constant wry smirk, Chef Roberto seems relaxed. He leans against the counter and chats with us, while his staff scurries around the kitchen: Lella, the Sicilian sous chef who’s been his right hand since he entered the restaurant business; a few eager Italian chefs-in-training; and a pair of timid young Japanese culinary interns, who study the master intently. “So,” Roberto finally says, rubbing his hands together. “What do you feel like eating? How about risotto?” He walks casually to the stovetop, pulls out a pan, and ladles in some vegetable stock from a simmering pot. He sprinkles in some rice and gives the pot a few stirs, then hands the spoon to Lella, who dutifully stirs and stirs and stirs for the next 20 minutes. The result: a luxuriously creamy risotto. On top, Roberto grates precious, aged parmigiano reggiano cheese — each crumbly little flake instantly melting into the steaming rice. And finally, he sprinkles the dish with his own invention: a pinkish-purple powder made from dried and finely grated beets. Both the cheese and the beets give the dish an earthy umami kick. A little sprig of fennel perches on top, like a Christmas tree on a snowy mountain. 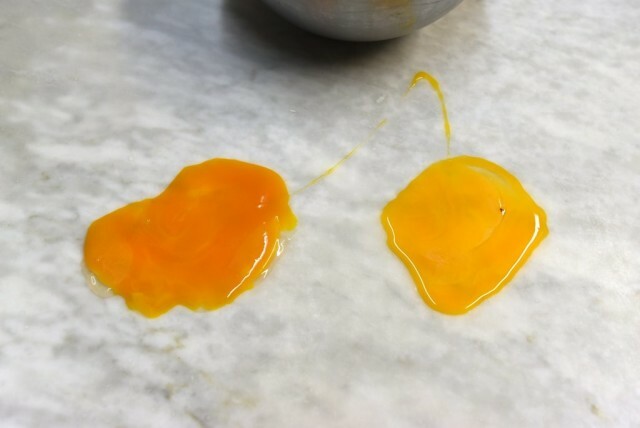 Point made, Roberto scrapes the eggs into a bowl, throws in some flour and a duck egg yolk (for elasticity), runs it through a mixer, then hand-kneads the small knot of yellow dough with mechanical precision. The moment it reaches the perfect texture, he invites us to prod it. 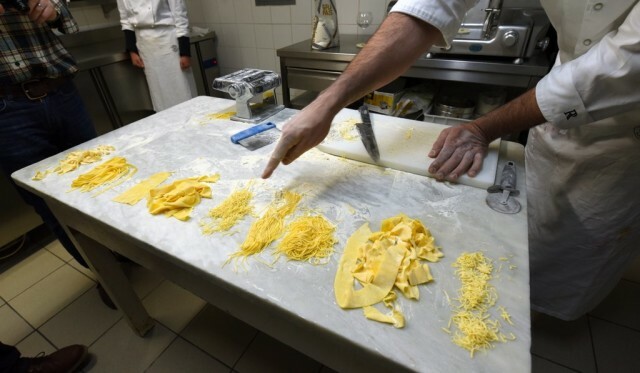 As he pulls each long, skinny, translucent sheet of dough from the roller, he folds it over on itself several times. 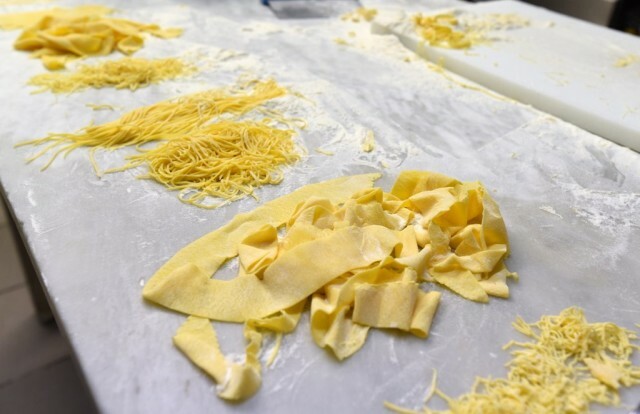 Then he attacks each little bundle with his knife, eyeballing textbook-perfect examples of different pastas. 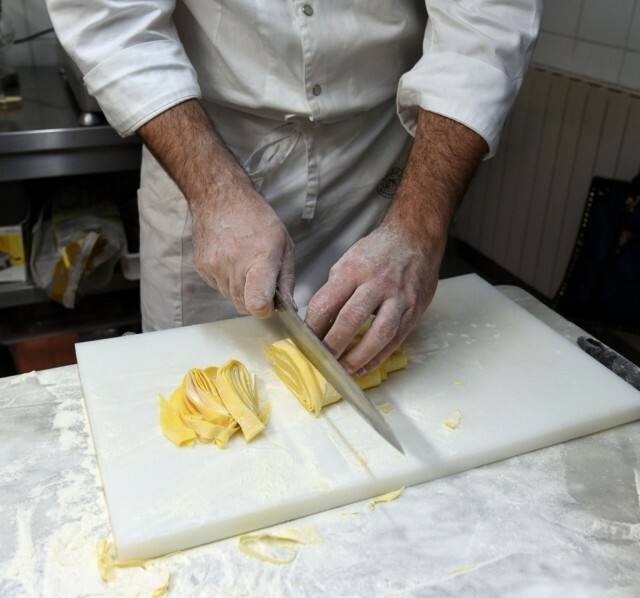 “Papardelle,” he says, chopping thick ribbons. “Tagliatelle.” This one is thinner. His hands work fast and furious — almost too fast to track. “Capellini.” Thinner still. 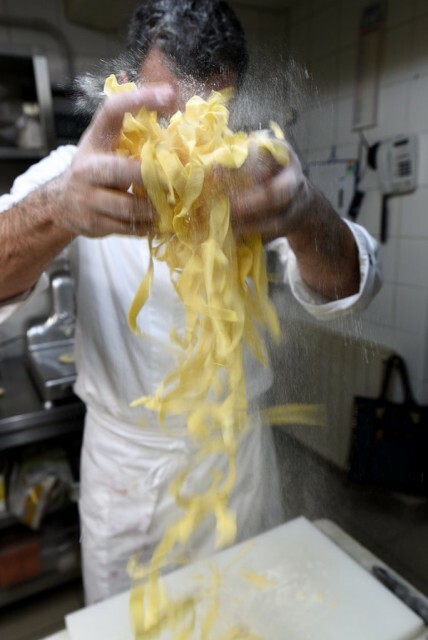 With each batch, he grabs the wad of new noodles and tosses them gently in the air. Stepping away from the table triumphantly and sipping his wine, he beams at his creation. 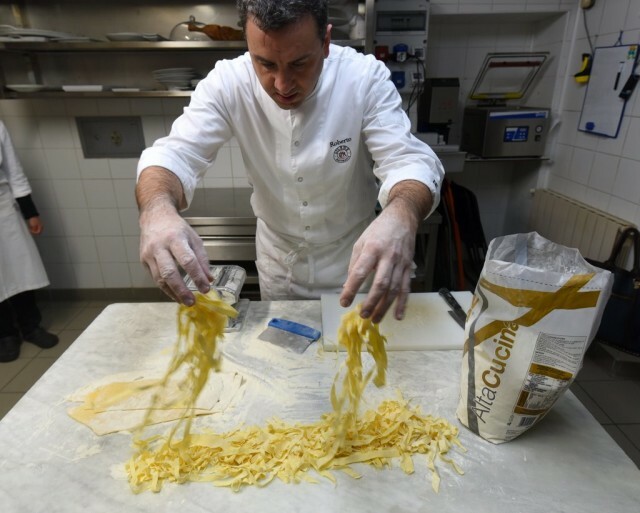 With nine different types of pastas lined up along the flour-scattered marble, it looks like the cover of a foodie magazine…all done in a just few minutes, by one man and his knife. Roberto sends one of his assistants to heat up our pasta (so fresh it needs only a brief, boiling bath) and mix it up with some turkey ragù. Delicious. Next comes a lesson in olive oil. Roberto holds up two squirt bottles. “The blue one is last year’s. Still good, but just for cooking. The green one is this year’s. For finishing.” Only a few days before, Roberto was at the olive mill down in the valley, where he personally watched the precious golden-green oil pressed out of his olives. We taste each one, and the difference is remarkable: Last year’s, still decent, has subdued, muted flavors. You can’t quite taste the olives. But this year’s? Explosively piquant. For an even better taste of top-quality oil, Roberto thin-slices a baguette and toasts the slices. Holding a bottle high in the air, he rains down a shimmering stream of golden-green oil, then tosses them with his hands. Crunching into the crusty, coated little discs, the pungent, acidic, tingly taste of fresh olive oil blankets our palates. Seeking another topping for his little crostini, Robert disappears out back and returns with a breast of turkey that he’s been slow-roasting for hours. “I don’t usually cook turkey,” he says. “But I know it’s Thanksgiving in America, so I decided to try. 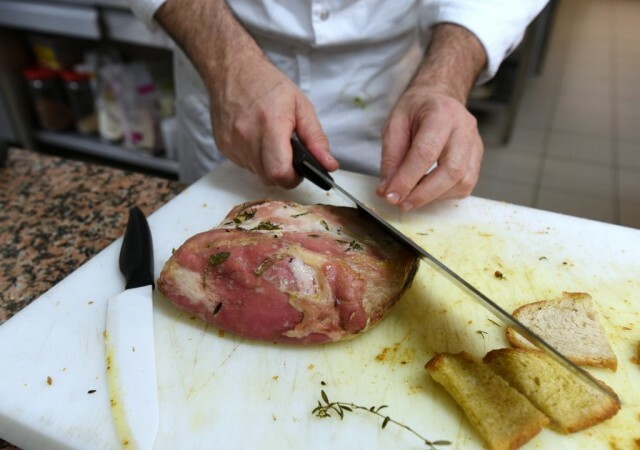 If you understand the principles of how to cook meat — salt, herbs, aromatics, slow-roasting at a low temperature — you can cook anything well.” He slices off some thin tastes. It is, without a doubt, the best turkey I’ve ever eaten. For another topping, Roberto makes a batch of his signature salsa verde: a vibrant-green sauce made with a generous bunch of Italian parsley, ample olive oil, a couple of medium-boiled egg yolks, capers, top-quality anchovies, and some salt. When we taste it, our questions of “What do you put it on?” are instantly answered: Anything. 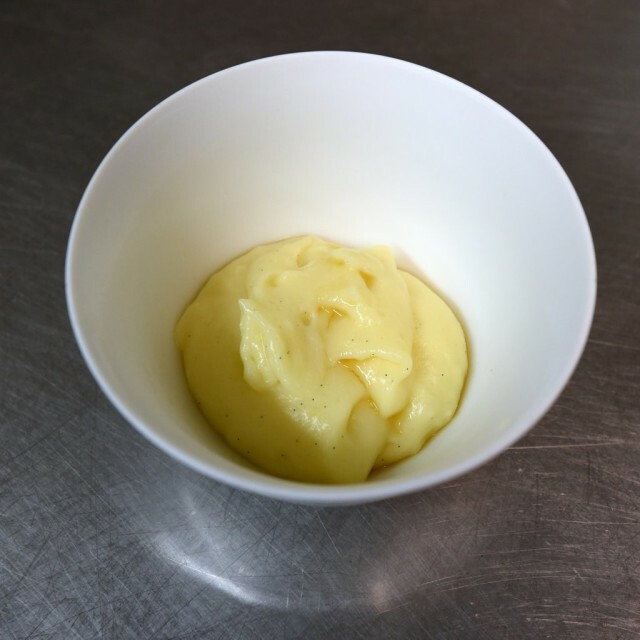 This outrageously flavorful, catch-all condiment tastes faintly of each of its ingredients, but is far greater than the sum of its parts. As we munch, Roberto explains his passion for wine. Not a rare quality in Italy — especially in Italian restaurants. But more specifically, Roberto has an affinity for very old wines. “Later on,” he says, “I’m going to open for you a very special bottle. From the Südtirol — the very northern part of Italy, in the Alps, touching Austria. It’s a white wine, aged several decades.” It’s the paradox of a great chef: He insists on only the freshest and most local ingredients, yet prefers extremely old wines from distant lands. Roberto explains that he recently returned from a trip to Spain. Near Barcelona, he visited the restaurant of a celebrity chef who owns a second Michelin star. Roberto enjoyed his meal, of course, but couldn’t help but stoke a little rivalry with his colleague. (He shows us the little sample of olive oil they sent home with him — in a gaudily labeled plastic bottle, which, as every oil aficionado knows, spoils the taste.) He tells us that this famous chef, who appears virtually every day on television, seemed very tired. “Well, I am not,” Roberto says defiantly, standing up straight and smiling wide. 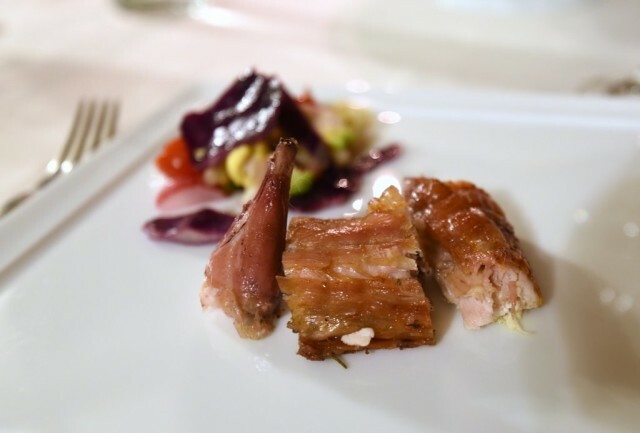 “I live here, in Pescina.” If we were wondering why such a talented chef chose to live so far off the grid…we have our answer. Our evening in Robert’s kitchen might seem like an unrealistic goal for the casual tourist. 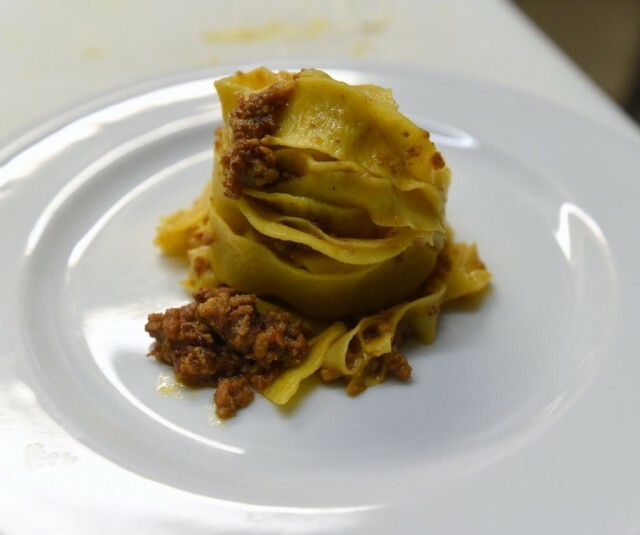 But, like the cooking class in Mama Laura’s home, these sorts of experiences are perfectly accessible to anyone who’s willing to do a little homework and make the arrangements. Hanging out for a couple of hours with Roberto, then dining in his restaurant, probably cost us just a few euros more than dining in the restaurant alone. And we came home with a renewed appreciation for how a top-end kitchen — and a top-end chef — masters the art of pleasing diners. Excellent series. Can’t wait for the next one. I agree with the first comment: Cameron is writing a sustained, highly interesting blog. We ‘Ricknics’ are reading it…so where are the supporting comments? This is some of the best travel writing and photography available to lovers of European travel. Weigh in! Excellent post! Must make pasta now! Wow! Great post but now my mouth is watering. Wonderful Blog Cameron! I rode up the gravel road with you and my mouth watered with each delightful description of the fabulous foods prepared by Roberto. Can’t wait for more! Great post! Would so love to do something like this. Wonderful. Keep them coming! I leave for Florence and Tuscany in three weeks. I have never been to a restaurant of this caliber. Hoping to go to this one! Amazing pictures and a great article. Thank you!